The Michigan state House has voted 105-0 to allocate $9.3 million towards helping the city of Flint manage its current water crisis. Roughly two-thirds ($6 million) of the funds are to help the city reconnect to Detroit’s water system, which the city disconnected from last year. Flint is a shrinking city with long-standing financial troubles that sits about 70 miles away from Detroit. It has been in state receivership since 2011. In order to save about $4 million annually, the city switched from Detroit’s water system to join an upcoming regional system instead. Since the new system will not actually be ready until mid-2016, water was drawn from the Flint River instead. Residents were skeptical of the decision, especially once reports of odd-colored water and strange odors started being reported. The trouble with lead came to light in September, when a Virginia Tech research team released a report saying that about 300 homes tested positive for elevated lead levels. A pediatric study also found that the levels of lead in some of the city’s children had become elevated since 2014. The rate had risen from 2.1% to four percent in most cases, and even six percent in some ZIP codes. These findings were corroborated by state officials. Water from Flint River tested clean after leaving the treatment plant, and the source of the lead was found to be in the distribution system. Flint’s plant does not use the same corrosion controls that Detroit had, which meant the water was able to erode pipes and allow lead to leech into the system from roughly 15,000 points where older pipes connected to the water mains. Flint officials have announced the intent to switch back to Detroit’s water while they wait for the regional system to be finished. State funds that have been set aside for Flint will serve to hire more workers for home and school drinking water inspections, increased lab services to test water samples, purchase water filters for residents, lead screening, treatment for children with elevated levels, and plumbing inspections. The Charles Stewart Mott Foundation is also donating $4 million to further help the city reconnect to Detroit’s water system. This is in addition to the $2 million Flint itself will be paying. 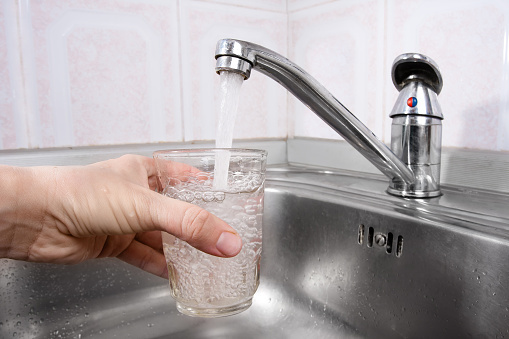 The recommended measures residents can take while the problem is addressed include running water for five minutes before using it, only employing cold water for drinking, cooking, and baby formula, and installing a lead-removing filter. Davey, M., “Flint Will Return to Using Detroit’s Water After Findings of Lead in Local Supply,” The New York Times web site, October 8, 2015; http://www.nytimes.com/2015/10/09/us/flint-michigan-detroit-water-supply-lead.html. Eggert, D., et al., “Michigan pledges $1M for filters, steps to help city’s water,” Associated Press web site, October 2, 2015; http://bigstory.ap.org/article/72fc19a8f47d44109552a11ecaebdcd5/public-health-emergency-declared-due-lead-flint-water. Eggert, D., “House OKs $9.3M For Flint; Delays Votes On Education Bills,” CBS Detroit web site, October 14, 2015; http://detroit.cbslocal.com/2015/10/14/house-oks-9-3m-for-flint-delays-votes-on-education-bills/. Erb, R., “Doctor: Lead Seen in More Flint Kids since Water Switch,” Detroit Free Press web site, September 25, 2015; http://www.freep.com/story/news/local/michigan/2015/09/24/water-lead-in-flint/72747696/.